Jaipur : A leading software development company of India in Taxation Domain, KDK Softwares, has today announced the launch of a national toll free helpline service for resolving GST related queries. The toll free helpline will be available in 6 languages - English, Hindi, Gujarati, Marathi, Kannada and Malayalam. 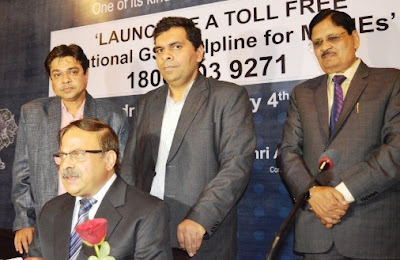 This toll free (1800 103 9271) helpline service was inaugurated by Chief Guest, Rajeev Swarup (IAS), Principal Secretary – Small Industries, Ajitabh Sharma (IAS), Commissioner Industries, Govt. of Rajasthan. Bihar have observed poor to average response. States like Kerala, Tamil Nadu, Karnataka, Telangana and Andhra Pradesh have started the registration program from 1st of January, 2017 and will be ending it on 15th of January, 2017. Once the first round of registration of GST will get over, Government will launch the second round of registration from March 2017.